So you�re looking for Luxury Invitations and One-of-a-kind upscale designer high-end invitations for your high-end upscale wedding or event. Well, see our luxury collection below. These cards will be like no other you have ever seen. These invitations and cards have been exclusively designed by our artisans while all papers have been imported from abroad. This stationery will truly awe your guests and they will become keepsakes. Surely, you believe that your invitations should be as unique as your event. 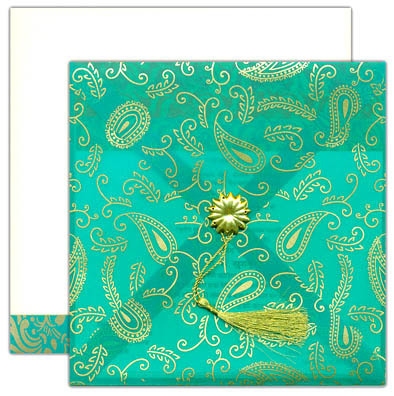 Description: Stunning hardcover invitation in tie-dye turquoise with gold motifs. 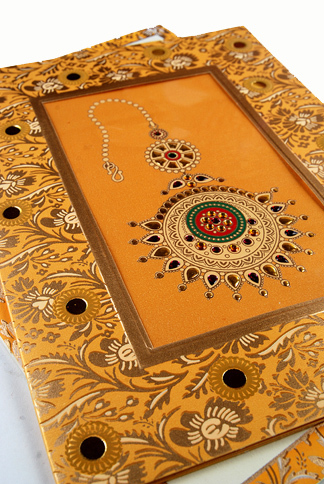 Front cover has a turquoise-gold lace embellishment with flowers made of gold sequin and beads. Inside, the card holds 2 or more inserts, rsvp card and any other additional insert cards. Matching RSVP Cards, Thank You Cards, Place Cards and Programs are available. Every single detail can be personalized to your preferred colors. You can mix and match scrolls, boxes, tassels, etc. Card colors can be customized! Description: Stunning hardcover "book" invitation - gold color or ANY color cover. Front cover has rhinestone embellishments and tassel on the side. Inside pages have multi-color motifs. See the video. Can be customized per client's specifications. Was designed for a celebrity. Matching RSVP Cards, Thank You Cards, Place Cards and Programs are available. Every single detail can be personalized to your preferred colors. You can mix and match scrolls, boxes, tassels, etc. Can be made in other colors! 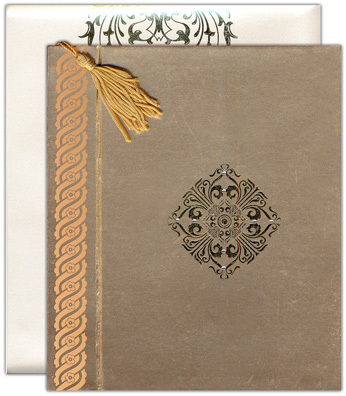 Description: Stunning hardcover "book" invitation - designer finish gold threaded paper. Front cover has rhinestone embellishments. See the video. Can be customized per client's specifications. Was designed for a celebrity. Description: Gorgeous oversized invitation card - cardboard floral motif backing - flowers centered with jewels. Pocket holds two inserts - one white, one gold. 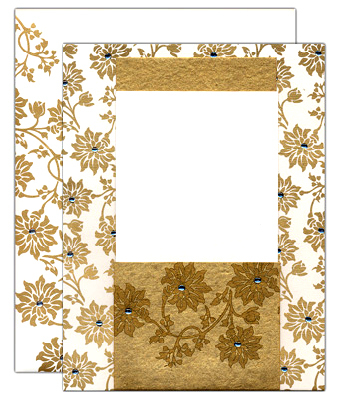 White envelope also has a floral motif in gold and can be made with or without jewels. 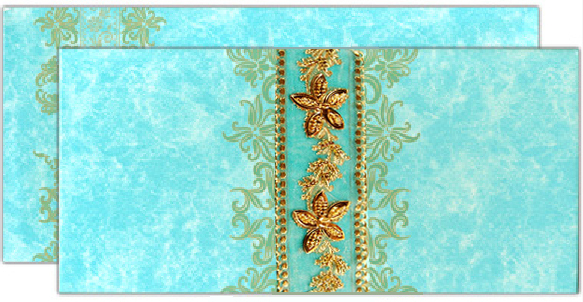 Description: Gorgeous oversized invitation card - cardboard floral motif backing - with sequin flowers around the border. Pocket holds two inserts. Envelope also has a floral motif. Description: Mud Khaki colored handmade paper folded card. Like a refreshing memory of the earthy roots this card awakes your organic senses. The front is plain and the texture is the main feature. The paste up on the front of the card can be customized with your monogram, symbol, etc. The inserts are pierced through a wooden stick. Description: Front of this fan shaped card is in Golden textured paper (300gsm) - hangs on a rod covered with multi-colored thread. 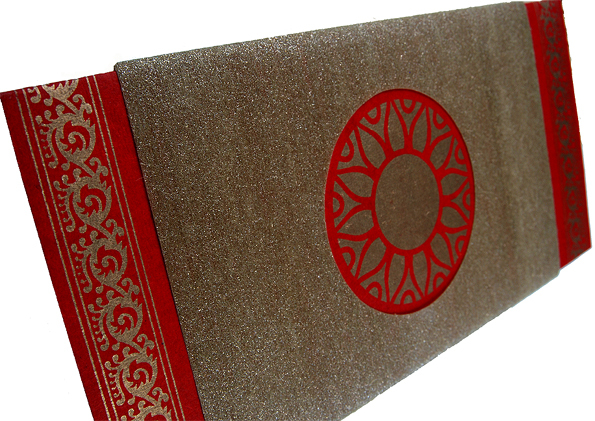 Inside interleaf and mailing envelope 225gsm) are red handmade paper. 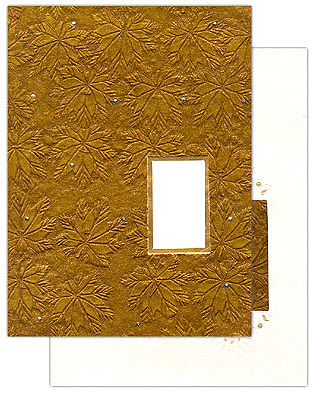 Description: This green silk handmade paper card is outlined by golden border with a gold tassel adding to beauty. We can customize the front of the card with a symbol or monogram of your choice. Inside, there are two inserts. Code: D017190 - Embossed Luxury Shimmery gold / cream invitation with a pocket window envelope and crystals. 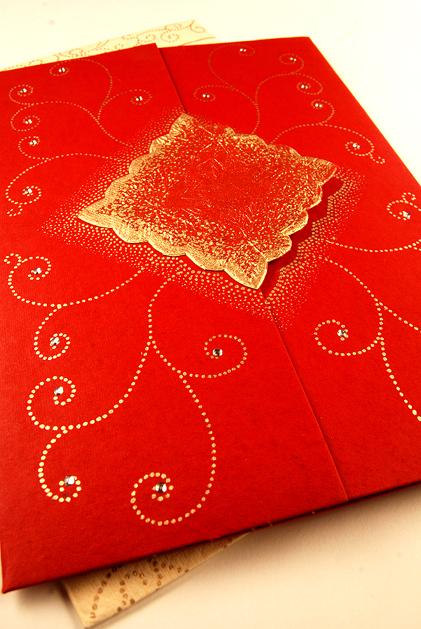 Description: Self embossed shimmery finish handmade paper for card. Inside interleaf, 2 inserts and pocket window envelope in shimmery finish cream. 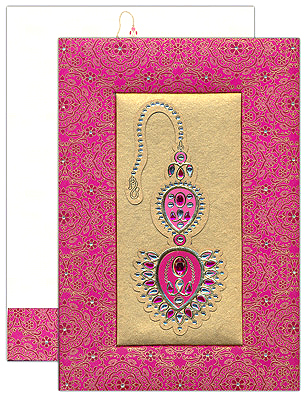 The card itself is from flower motif textured paper (250gsm) covered with crystals. Description: Turquoise color translucent paper jacket card holding 3 cream color inserts with multi-color borders.. Description: This card is hardcover - i.e. feels like a book. 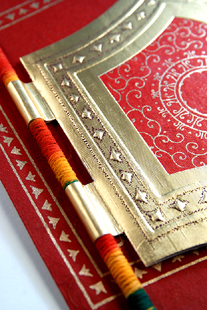 Card front and envelope's inner lining is made out of designer thread-finish golden paper. Inside pocket holds inserts in cream color. Gem stone varies. Specific colors can be requested. Card style can be customized. Description: Yellow shimmery finish card stock (300gsm) for card, mailing envelope and 2 inserts. Design on the middle front flap of the card can be customized. In the photos, you can see some previous designs done for our past clients, such as imprints or elaborate & intricate jeweled designs. Inside inserts are held in place by two red ribbon pockets in corners. Mailer envelope has a matching elaborate border. Code: D021940 - Luxury "The Peacock" - Orange Shimmery Finnish Paper Pocket Invitation Card with peacock feather attached. Description: Orange shimmery finish card stock (300gsm) for card, mailing envelope and inserts. Design on the middle front flap of the card is a peacock feather. Inside inserts are held in place by a pocket fold. Description: The front of this card has a jacket with gold glitter base with a die cut circle window in the center which shows the golden motif. The rest of the front has bordered design in gold. The Cream inserts and the Cream mailer envelope have a matching border design. Paper colors can be changed. Other colors available! 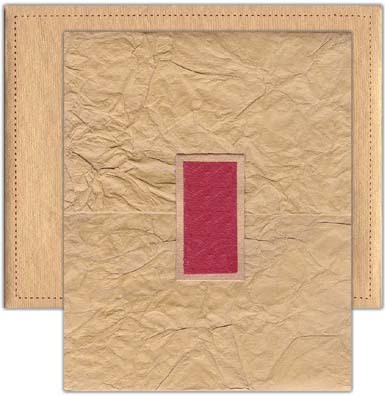 Description: The front of this red handmade paper card has a door style opening with a diagonal square layer. The jacket has golden motif detail with rhinestones. 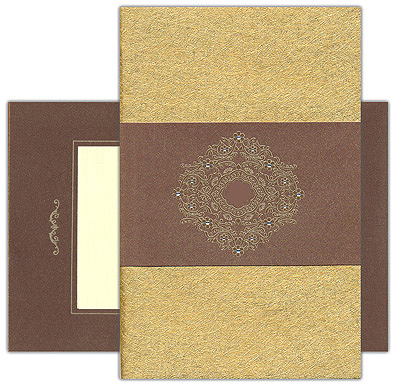 The Cream pocket inserts and the Cream mailer envelope have a matching gold motif design. Code: D015220 - Luxurious and Amazing yellow silk cloth padded invitation with golden motif on the front and inserts inside a pocket fold. 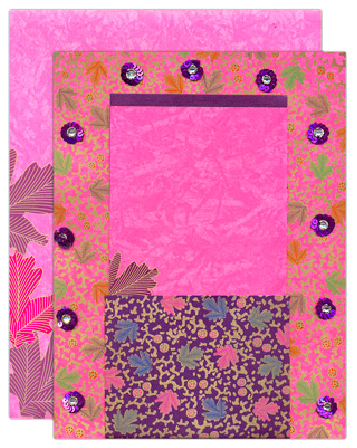 Description: This beautiful elegant one of a kind card is made of silk cloth and is padded. With golden design printed all over the front of the jacket. The pocket holds inserts inside. The Inserts, mailer box and inside lining is made of shimmery finish yellow card sheet. Mailer envelope has a pattern as well. Paper and silk cloth colors can be changed. Many other colors available! 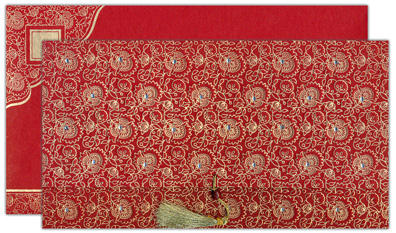 Description: A frame that captures the golden memories of your event, this cloth embroidery invitation has the front in a combination of padded cloth frames with embroidery work over a red cloth background. The central frame can have your design, logo, or monogram, or you can place your photo. There is a golden tassel all around the invitation. Tassel has white/read pearly embellishments. The inside lining and insert cards can be in any color your prefer. The mailer envelope matches the invitation in design - but is made out of high-end paper stock. Description: A frame that captures the design of your making. Front has crystal jewels all over the card and the frame is padded. Inside holds insert card(s) in a pocket. Paper and jewel colors can be changed. Many other colors available!